Rachel Carosiello and Ann Marie Ryan built a devoted clientele at Rachel’s retail store in Cherry Hill, which evolved from a boutique home décor shop to the cornerstone of their growing interior design business. In time they realized that running the store was holding them back from taking their design venture to the next level, and began to look for a new location devoted to that enterprise. Now that Carosiello and Ryan have settled into their imaginative Modern Vintage Home office and showroom on Main Street, the two designers are poised to be Moorestown’s go-to home interior specialists. The former site of Moorestown Tailors (now located next door) has been completely transformed into a welcoming studio filled with “what if” room-scapes, floor samples and creative work areas. To the surprise of anyone who has been in this space in the past, an open stairway from the main level now leads to a dazzling showroom downstairs where people can envision how furniture, fixtures, rugs, and accessories will look in their own homes. One wall is lined with fabric and other samples that clients can peruse while enjoying the stylish comfort of the furniture in the room. Everything is carefully culled from eclectic sources the owners have discovered through their years in the field. There is no typical day at Modern Vintage Home. The partners’ calendar is filled with meeting clients in their homes or the showroom to assess needs, overseeing installations and deliveries, spending design time at their desks, and traveling across the country to build their knowledge about the field. Consultations at the office and showroom are by appointment, but they try to reserve Fridays to be on site and welcome people to drop in and meet the owners. “We love what we do, and we love our customers,” notes Carosiello. Because the process takes time and involves really getting to know people to discern what they want, the two have developed friendships with many of their clients. “It’s a very personal business,” explains Ryan. “People trust us to do what’s in their best interest, and we are very transparent—there are no hidden costs.” The two township residents estimate that 60-70% of their business is in Moorestown, and many of their clients come to them because of enthusiastic word-of-mouth referrals. No job is too small or large for Modern Vintage Home. “People can come for something as simple as bar stools or a light fixture, or we can start from the ground up. We work with select contractors and are very particular with the quality of their workmanship,” said Carosiello. The partners have flexibility with all budgets and understand that every client’s personal style is unique. While most of the work they do is local, they are developing a lot of ‘second home’ business, helping clients with beach properties and even assisting with relocations as far away as Nashville. But ‘home’ is where their heart is, and they are looking forward to sharing their comfortable, convenient and engaging business on Main Street. 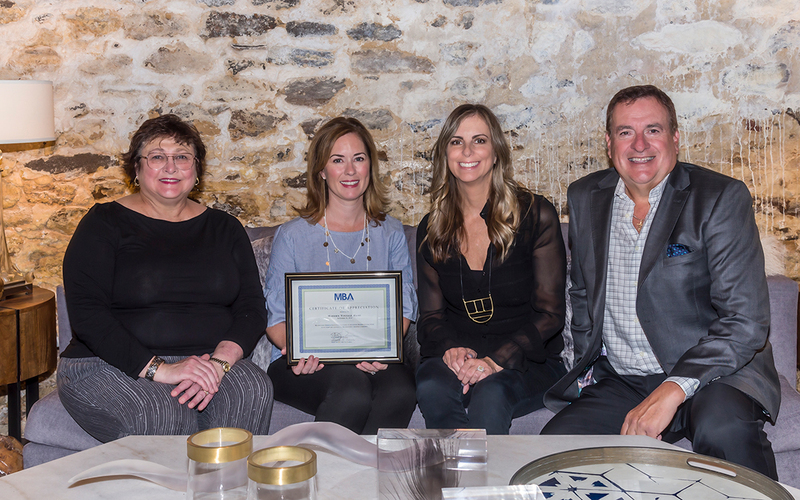 Moorestown Business Association applauds Carosiello and Ryan for relocating their distinctive business to Moorestown, and are pleased to welcome Modern Vintage Home as an MBA member. To learn more, visit www.modernvintagehome.net.